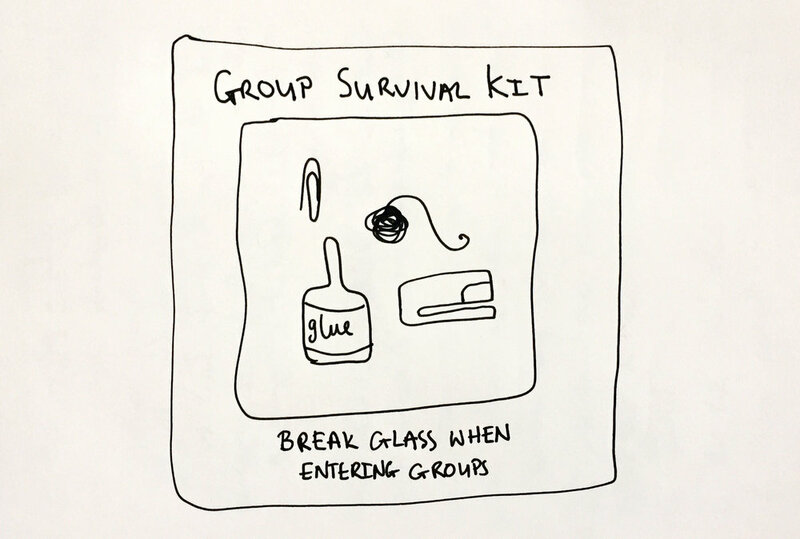 Group survival kit. Drawing Luke Hockley. I like my groups to be filled with both men and women, I like them to have clearly defined boundaries and I like them to have a clear leader. Last night I found myself in a group of men who are meeting with boundaries that (to me) are still being defined and that is led by the group (everyone is the leader rather than one individual holding that role). In these situations I am holding myself together with bailing twine and paper clips. I tend to take over. If something happens that makes me feel unsafe in a group then I tend to take default to the facilitator role in order to make myself feel safe. This year I have really been looking at this behavior. I see it as a strength, of course, sometimes groups need the clarity that I can bring. But sometimes, if someone else is leading or if the group has decided there is no leader and I have chosen to come along knowing that, it is isn’t appropriate for me to do that. This is when I feel incredibly unsafe. At these moments I am really left out on a limb naked. I’ve realised this is so confronting for me because what it requires is that I express how I am feeling as a member of the group and that I then make myself vulnerable to the group because they can decide whether they help meet my need to be safe, or not. Last night I did a good job of expressing how I felt rather than taking over the group. That was a big step for me. I’m very pleased I was able to do it. Newer PostA union of 2 people. Older PostDoes anything I do really matter?